The Denner and Assistant Denner comes to the center of the room. The Denner stands behind the US Flag stand; the Assistant Denner stands behind the Pack Flag stand. The ceremony starts with the Denner asking everyone "Would you please stand for the presentation of our nation's and our Pack's flags." Everyone stands. Once everyone is standing, the Denner then commands "Color Guard POST!" The two Cub Scouts carrying the US and Pack flags then come down the aisle. The US Flag is in front and the Pack flag is in back. The flag carriers go to where the Denner and Assistant Denner is standing (that's done because sometimes the flag carriers can't see the flag stand and sometimes they trip over it...) and then faces the audience. The Denner then states "Would you please join me in the Pledge of Allegiance." He then faces the flag, and commands "SCOUT SALUTE". Once he salutes the flag, he pauses and then leads the Pledge of Allegiance. Then, the Assistant Denner states "Please take your seats. Cub Scouts and Scouters please remain standing and join me in the Cub Scout Promise." The Assistant Denner then faces the flag and commands "Scout Salute!" Once again, once everyone's ready, then he leads the Pack in the Cub Scout Promise. Again, when he is finished, then he lowers his hand and commands "TWO," which gives the "instruction" for everyone to lower their hands. The Denner then states "Post the Colors" and both flag holders place the flag into their appropriate holders. The Pack flag goes in first, and then the U.S. flag. 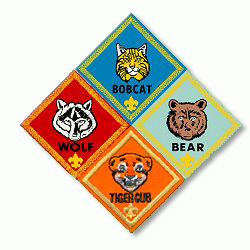 Once that is done, the ceremony is finished and all four Cub Scouts can join the rest of the Den at their seats. Some prompting may be needed by you or another adult as some Cub Scouts experience stage fright after practicing for days and weeks for the big night. Comfort them before and afterwards that everything that they do is in practice for those times as an adult they will have to lead people. And coach them through the rough spots when it may seem that they've forgotten what to do next.